The uninhabited rocky island of Grassholm lies 15 kilometres west of the Marloes peninsula in south Pembrokeshire. It is remote and exposed, surrounded by difficult and turbulent seas. Yet this tiny rock barely 400m across is home to the remains of stone-built round houses, building platforms and field enclosures dating from prehistoric to recent times. Getting to Grassholm is difficult as it is the third largest Atlantic gannet colony in the UK supporting seven percent of the world’s population. It was the first RSPB reserve established in Wales in 1948 and public landing is not permitted. However the Royal Commission was lucky enough to accompany the annual RSPB autumn visit out to the island on 14 October 2016, when three small teams of specialists worked to free fledgling birds from plastic marine debris. 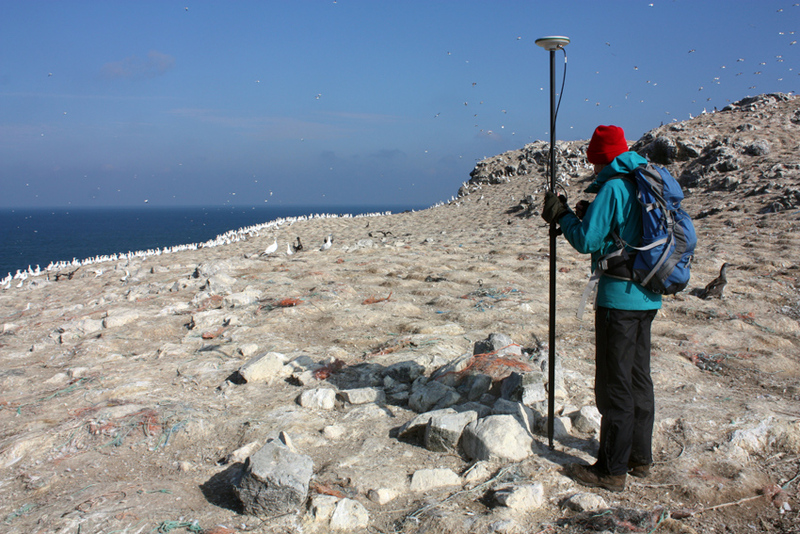 Royal Commission archaeologists last visited Grassholm with the RSPB in 2012, making the first survey and record of its complex archaeology since the early 1970s, and checking new features revealed on recent aerial photographs. Early surveys and excavations by Douglas Hague and the Ordnance Survey in the 1960s and 1970s recorded conjoined rectangular and cellular buildings on the western part of the island, close to one of the few water sources. Since that time nesting gannets have grown to cover nearly half of the island with their pedestal nests of mud, obscuring these earlier sites. However, archaeological sites on the central and eastern parts of Grassholm are now being revealed. The collapse of earthen burrows of a former puffin colony, together with the effects of climate change bringing windblown erosion, heavy rainfall and salt spray, has scoured off the loose topsoil. A complex of sites has been revealed with stone built huts, field boundaries and even possible early water storage ponds. Royal Commission archaeologists made new discoveries on the 2016 visit including a small stone-built roundhouse, possibly prehistoric, and a complex set of walled enclosures surrounding a building platform, which may be medieval. 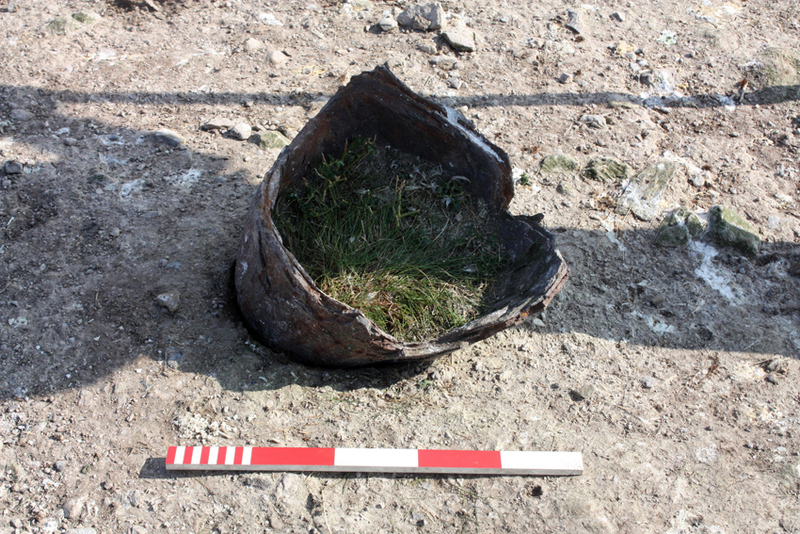 No artefacts were found, apart from the rusted nose cone of a rocket projectile dating from when Grassholm was used for bombing practice during the Second World War. The range of structures visible on such a small and remote island attest to centuries of settlement. As such Grassholm is a very special place for its archaeology and future survey and research may allow its complex history to be better understood and dated. The Royal Commission would like to thank the RSPB for allowing us the opportunity of visiting the island, and Tim and Beth from Venture Jet for an exhilarating, and very wet, return journey to this outermost isle. Fragmentary walls survive from an early settlement excavated in 1972, now surrounded by gannet nests. 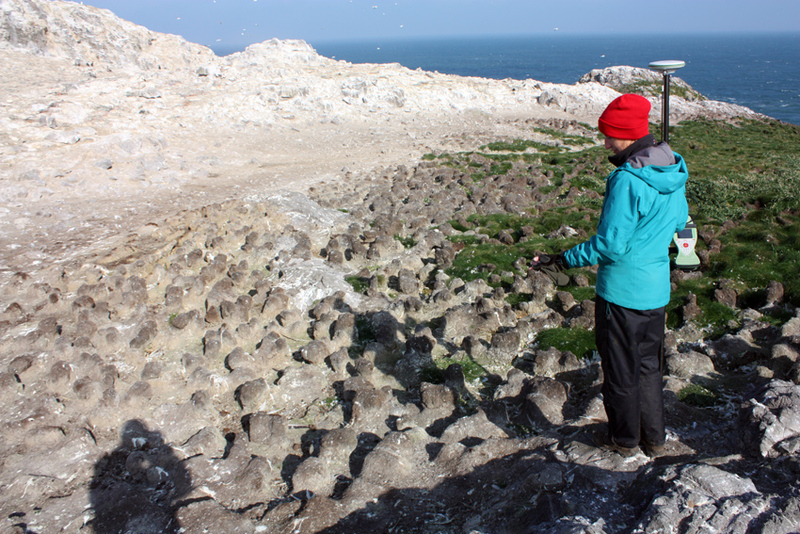 The fragile and eroding ground surface of Grassholm, which is revealing previously hidden archaeological sites for study. 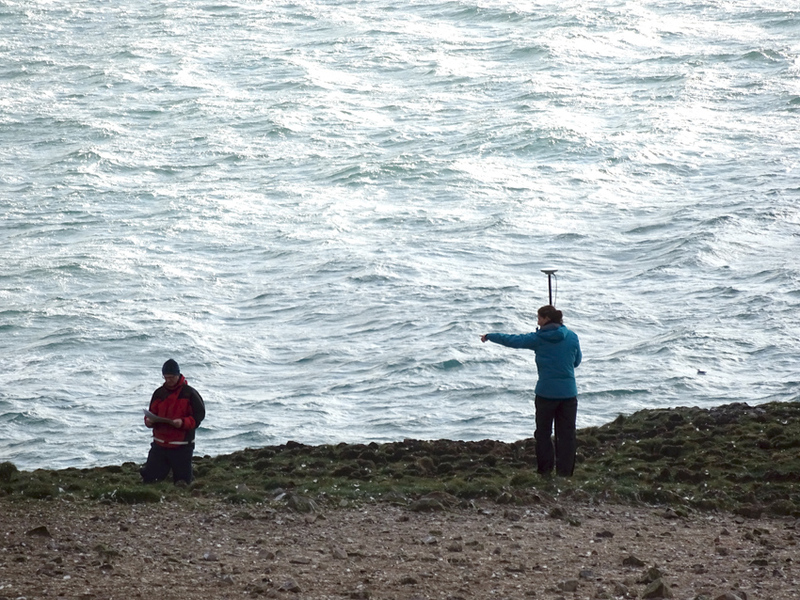 Louise and Toby surveying on Grassholm, seen against a wild sea. Photo courtesy of Greg Morgan, RSPB Ramsey Island. Rusted nose cone of a bomb or rocket projectile dating from Grassholm’s days as a bombing target in the Second World War.